If you work in a library you are keenly aware of the increasing demands on staff time. It seems that new endeavors begin every semester, but rarely is new staff hired to lead those endeavors. Last year my department engaged in a workload study in order to identify what’s the best use of our time, in other words, what could we stop doing in order to release time and energy for pursuing new endeavors. We investigated four primary functions or tasks: reference, instruction, LibGuides, and consultations. I chaired the instruction study. •	What courses are worth the time to teach? What courses should we not teach? •	Should MLIS interns be teaching more English 102 and Ed Psych 100 sessions? •	How can we continue to grow our instruction program given our current teaching load? •	How can we better alleviate the teaching load for those librarians who feel overwhelmed? In concert with these investigations, I also co-facilitated three free-think exercises at three different department meetings that were designed to elicit sharing of ideas about work passions and preferences for recognition. Curiously, one of the practical takeaways from this experience was the importance of investing time and energy into building an organizational culture that values the big and small contributions of people. Since I coordinate our instruction program, one of the problems I wanted to tackle was the issue of burnout. With a large load of one-shot instruction sessions, many librarians experience stress due to the repetitive nature of the work coupled with the intensity of the need (see: Deborah F. Sheesly in 2001, Burnout and the Academic Teaching Librarian: An Examination of the Problem and Suggested Solutions. The Journal of Academic Librarianship, 27:6, 447-451.) Beyond lightening the load, I am not able to award bonuses or sabbaticals, so I decided to get creative! Best Tricked Out Slinky Wins! This semester I attempted a gift that would encourage my colleagues to join in the fun and recognize the contributions of their colleagues as well. 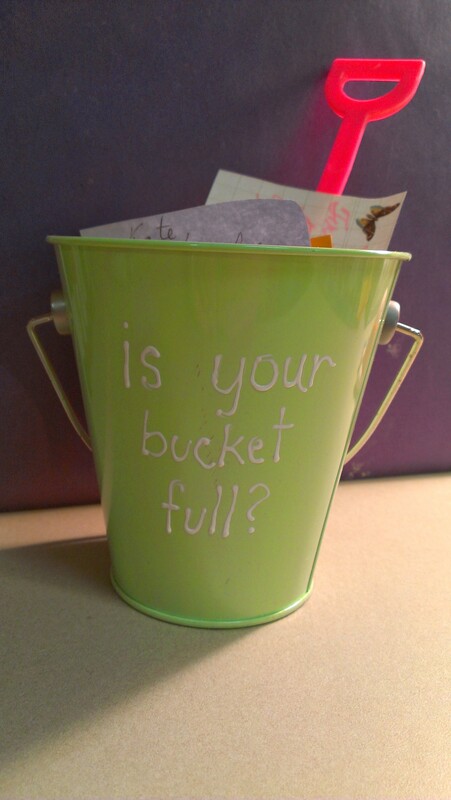 The idea came from a book my kids received titled Have You Filled a Bucket Today? A Guide to Daily Happiness for Kids. The simple idea of the book is that you are happiest when you are kind to others. Your bucket, a symbol of your happiness, is full when you are busy filling others’ buckets. Taking the metaphor literally, I went shopping for some small, colorful buckets and filled them with colorful scraps of paper and wrote a note of encouragement for each person. The extra papers are there for them to pass along to others. I did not provide instructions so there was some confusion at first (“Yes, my bucket is full because I am stressed out!”), but folks have started to catch on and folks are filling up each others buckets, literally and figuratively! How have you encouraged a spirit of thankfulness or teambuilding at work? How have you gotten creative on the job and built fun into your workday?